Akka is a toolkit and runtime for building highly concurrent, distributed and resilient message-driven applications on the JVM. It’s a part of Scala’s standard distribution for the implementation of the “actor model”. Messages between Akka Actors are exchanged in Mailbox queues and Dispatcher provides various concurrency models, while Routers manage the message flow between Actors. That’s quite a lot Akka is doing for developers! Needless to say, Sematext has embraced this philosophy and contributed the Kamon backend to Sematext Monitoring. 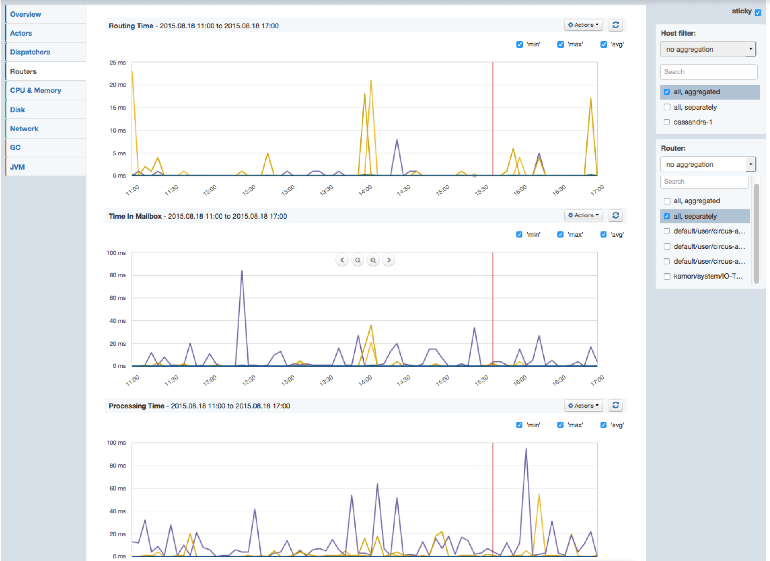 This gives Akka users the option to use detailed Metrics from Kamon along with the visualization, alerting, anomaly detection, and team collaboration functionalities offered by Sematext. 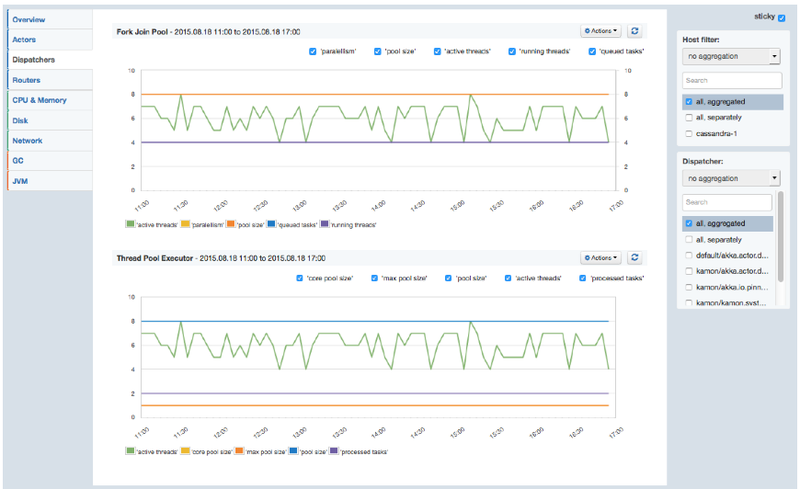 A single Sematext Monitoring App can take metrics from multiple hosts to monitor a whole cluster; filters by Host, Actor, Dispatcher, and Router make it easy to drill down to the relevant piece of information. Each of the above metrics is presented in aggregate for all Actors, but one can also use Sematext filtering feature to view all Actors’ metrics separately or select one or more specific Actors and visualize only their metrics. Filtering by Host is also possible, as show below. 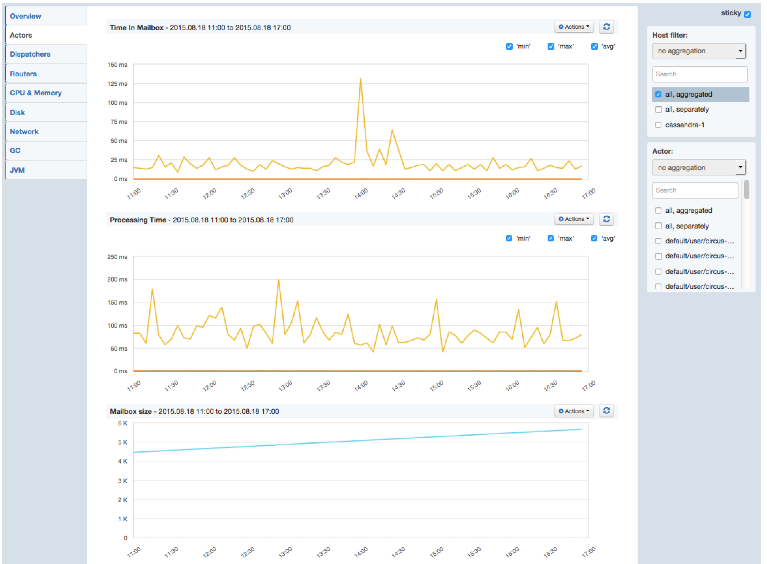 You can set Alerts and enable Anomaly Detection for any Akka or OS metrics you see in Sematext and you can create custom Dashboards with any combination of charts, whether from your Akka apps or other apps monitored by Sematext. We hope you like this new addition to Sematext. Got ideas how we could make it more useful for you? Let us know via comments, email, or @sematext. Not using Sematext yet? Check out the free 30-day trial by registering here (ping us if you’re a startup, a non-profit, or education institution – we’ve got special pricing for you!). There’s no commitment and no credit card required. 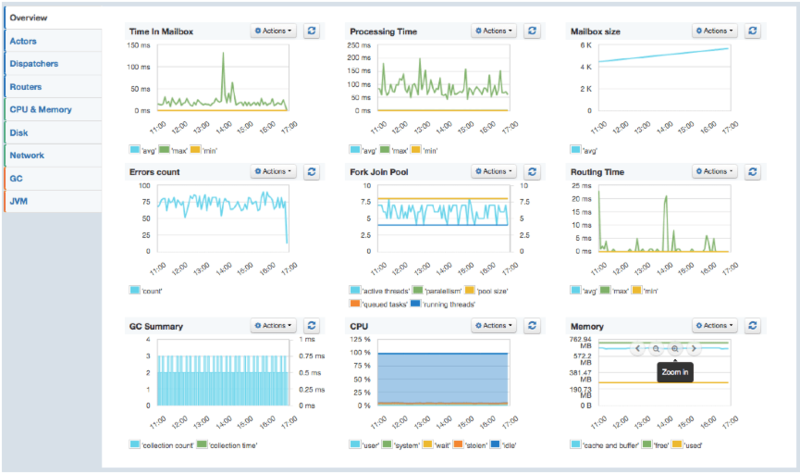 Sematext monitors a ton of applications, like Elasticsearch, Solr, Cassandra, Hadoop, Spark, Node.js (open-source), Docker (get open-source Docker image), CoreOS, RancherOS and more.